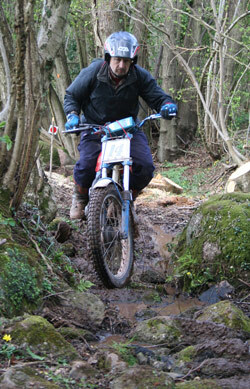 Trials events come in many different flavours: Modern, Pre-65, Long Distance, Trail bike, Sidecar etc. As a club, we run events covering most types. In all these events, the purpose is to test rider and machine ability over a number of prepared or natural obstacles. 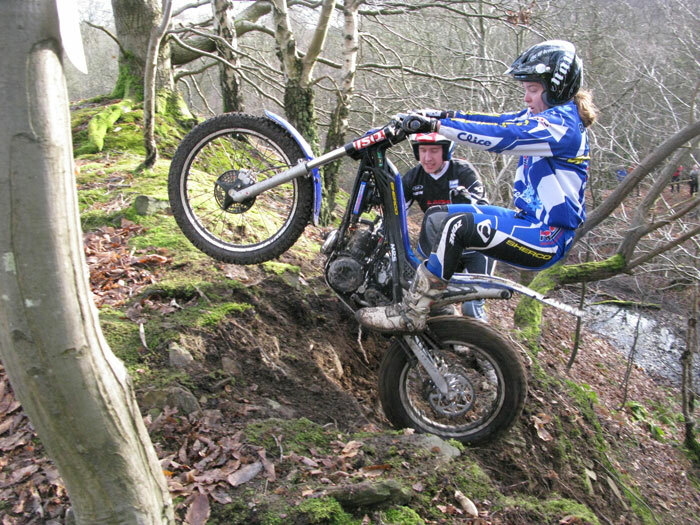 For most people 'Trials' will mean Modern trials, with a course set out typically in woods or a quarry, with a number of 'sections' maked out with routes for the various classes, through which the riders must navigate without 'dabbing' or putting their feet down. 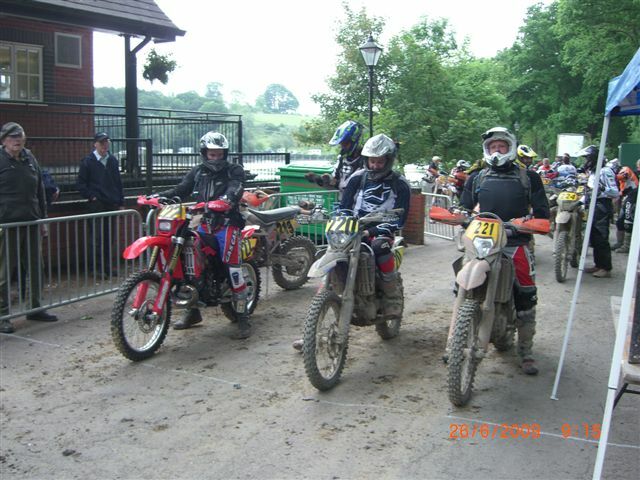 Similar events for other classes such as Pre-65, Trailbikes and sidecars are often run seperately to cater for the specific capabilities of the machines, although good riders on old bikes often show modern riders how it's done! The rules for Modern Trials can be found in the ACU handbook, which includes descriptions of bikes, types, marking of sections, scoring etc. Pre-65 trials are runs using very similar rules to Modern trials but organisers will set out their course and sections to suit the older style machines. 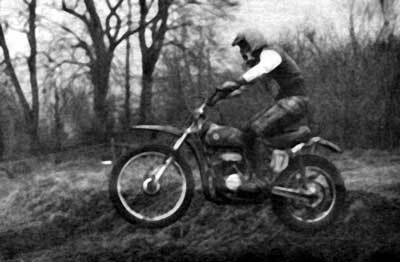 Long Distance Trials (LDT) hark back to the early days of trials, where riders would ride their machines to and from events, where machines were not as specialised as modern machines. These LDTs are aimed more at trail riders who would like to ride something with a competitive element. As the name suggests, these events include an element of 'distance' (our own Wyegate Trial has been known to nudge 100miles!) and are essentially a trial ride with some Trials sections and sometimes even a special test to do along the way. Machines used vary greatly from little Honda XL125s to big KTMs, although the spirit of these type of events remains with riders of smaller Honda XLs, Yam Serrow, Gas Gas Pamperas, Beta Alps and the like. The Wyegate is the club's major annual event, if only because of the amount of effort it requires to stage. Many of our club members have been and still are Sidecar fans, and some very successful too. Enduros come in two flavours, traditional Time Card like the Welsh 2 Day, and Hare and Hound events like our own Chicken run. Time Card Enduros are run using a time-card! On this are recorded the times at which a compititor enters the various checkpoints around the Enduro course - a bit like a car rally in some ways. The organisers will set out a course which will include a number of 'checks', each with a checkpoint at the end. 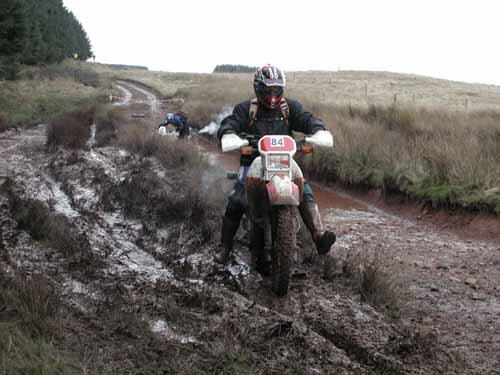 A short course for example may have a single checkpoint which is visited once at the end of a fixed number of laps (EG Corinium), and at the other extreme, events like the single lap Welsh and Powys Enduros will have a number of checkpoints around the course only visited once. For all these types of events, at the start, will be displayed the times that competitors are expected to ride each of the 'checks'. E.G. Check 1 takes 20mins, check 2 takes 15 mins. etc. As riders are started in 2s, 3s or 4s at minute intervals, each rider has to calculate the arrival time at each check from their own start time. Competitiors write these ETA times onto their timecards in the correct column. When entering a check, the timekeeper writes the actual arrival time into a second column. The idea is to be on time, as entering a check early or late will incur penalty points. It starts getting complicated for riders who run late as it is not possible to make up time. Let's say you had a minor breakdown or a tumble which made you 10 mins late at a check. If the next check had a 15min allowance, you still have to do that check in 15 mins, so you now have to readjust your ETA times, adding 10 mins. If you rode the check in only 5 mins and clocked in - trying to get back your lost 10mins - you would actually get an additional 10 min penalty for being early! Any lateness must accumulate, up to 60 mins which means exclusion. These type of events will usually also have a timed 'special test' which may be part of the course - a cross-country test - or something like a MX style test. Either way, the time taken to do the test is added to the rider's penalty point total - the faster you go on a test, the less penalties! Hare and Hounds events are quite different to Time Card events. They are typically run over much shorter courses to give a multi-lap event which could be thought of as a long-distance MX race! The object is to do as many laps as possible in the allowed time. The riders are usually started en-mass by class at minute intervals. Races are commonly run over 3 hours but may be shorter or longer. Riders can stop to refuel or rest in the designated area as often as they require. After the race time is up, the flag will drop and no more riders will be allowed to start another lap. The scoring is simply the number of laps plus the time taken for the last lap - so no maths involved for the riders! These days, most races are run using transponders, so all the scoring is taken care of electronically. These type of Enduros like our own Chicken Run are becoming more popular as it is becoming increasingly difficult to run the Time Card events due to restrictions on land availablitiy, and also because of the huge effort required to put them on. H&H events can be excellent if gruelling fun - no rest for 3hrs! 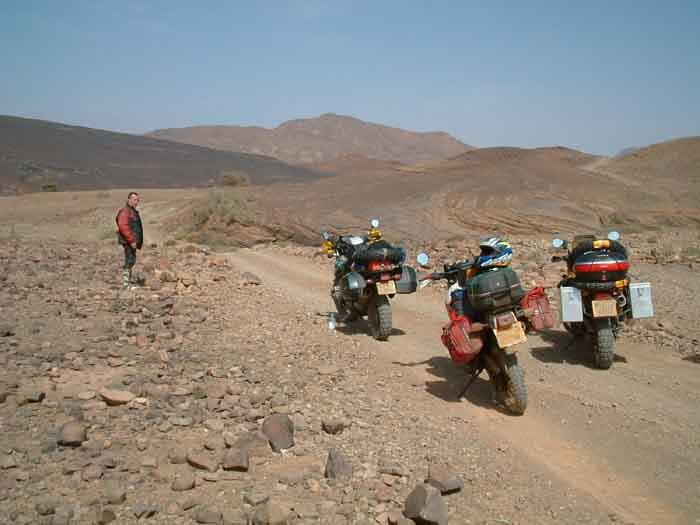 Rallies are run very much like a Time Card enduro, but are much easier, catering for big bikes like GS BMWs, Africa Twins and KTM Adventures. They are generally run by clubs using Forestry land, utilising mainly the forest tracks but also usually with an amount of Enduro-style 'going'. These events are suitable for all abilities and ages and are especially useful for anyone who wants a taste of what a proper Enduro is like, and also for all us old codgers who are finding Enduros a bit hard these days! There's usually a good mix of classes split between Trail bikes and Sports (enduro) bikes. 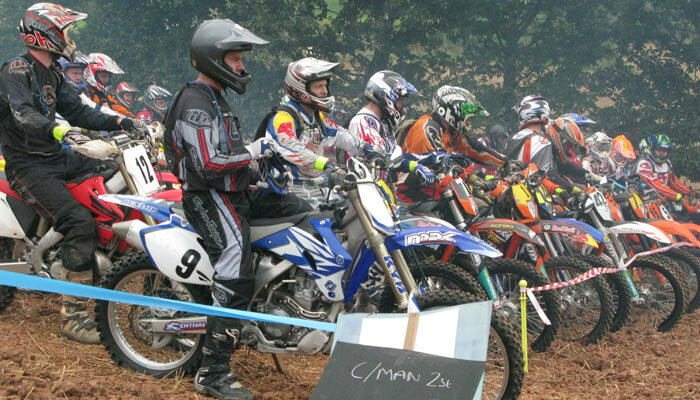 Trail bikes range from 250s to BMW 1200s, and 4-stroke Enduro bikes are most popular in the Sports bike classes. These events are very relaxed social affairs - there's usually enough time during the event for a burger and a cup of tea! Popular events include theBeacons, Cambrian, Hafren, Radnor and Tarenig, and for those more adventurous, how about the Alto Turia ride in Spain? For pot-hunters there's even a championship! Still popular, but becoming increasingly difficult with the recent changes to rights-of-way. We are lucky in our locality to still have sufficient lanes for the occasional day out, and also to allow the running of the Wyegate Trial. There even still some members who venture out in the worst of weather! If you're keen for trail riding, the best contact is the Trail Riders Fellowship. If you want more space to ride, and to ride where you're welcome, then it's France with Sport-Adventure, Spain or even Thailand with Taffy. Many of our club members have ridden on the various trips run by Chris Evans to Normandy, Morvan, Lozere and the Pyrenees, so all these trips are highly recommended. For Spain, the Alto Turia is a well recommended week long navigation event, and although we havn't yet tried the other offerings (yet) from the same organisers, they certainly look interesting! Many of our club members will also know 'Taffy' who a couple of years ago set himself up in Thailand. 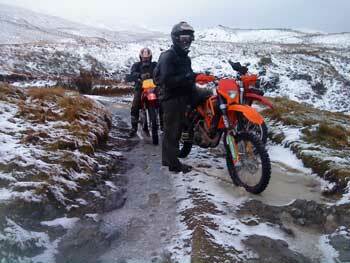 One of our members has ventured across the globe for a successfully test ride! Many motorcyclists have more than one machine tucked away in the garage. Alongside the competition bike there is often a road bike, perhaps for commuting but more often for those summer rides or trips away. Over the recent years we've had club members in France, all over Europe, in Morocco, New Zealand, trekking across Australia, crossing America (quickly!) to Alaska, and nearer home to Ireland. The social side of the club is just as important as any event. Club meetings happen twice a month and are well attended. The annual Sporting Review is a good occasions to get together and celebrate our successes with friends, landowners and fellow competitors. On other occasions we've tried fun events like the Moped bash! Until a couple of years ago, we also used to run regular evening 'Road Trials' or treasure hunts, but we seemed to get to a point where we'd been everywhere within 20 miles! Perhaps now's the time to try a couple again?